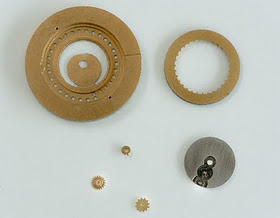 Those five parts, including the dial, comprise the moon phase complication. This is a factor of four or five less than usually used, and triple the accuracy anywhere else: one day in 3,478.27 years, all built on a base ETA 2824. But let’s back up a bit and put this watch in context. ochs and junior is basically Ludwig Oechslin and Beat Weinemann. Ludwig is a senior and famous watchmaker, with headline experience at Ulysse Nardin, MIH and others; this company is basically him making whatever he wants. I asked to review the moonphase but there’s also a dual time, annual calendar, child’s 7-day and more. So the watch nerd in me is impressed. Let’s dive in. You’re looking at the packaging. 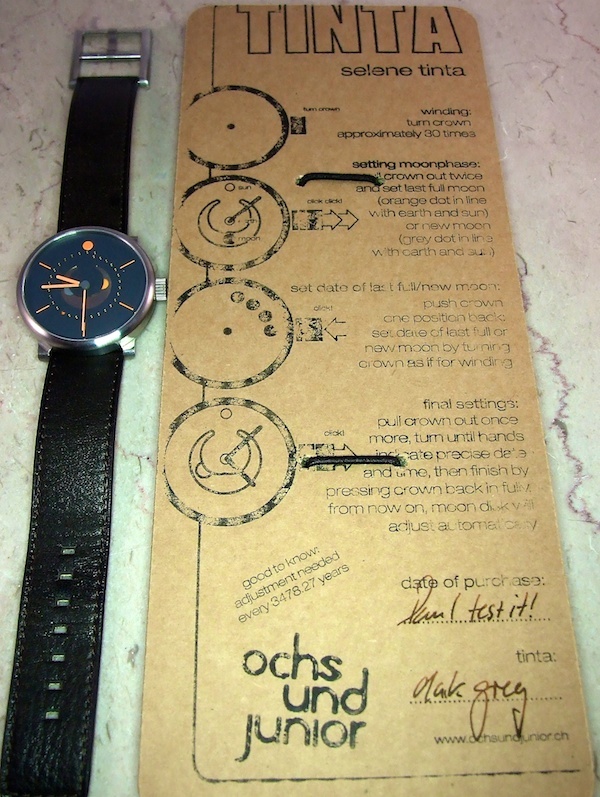 The watch is strapped (pun intended) to a recycled cardboard piece with instructions printed on it, and shipped in a recycled cardboard box filled with wood shavings. Vegetable-tanned leather, of course. It would not be much of an exaggeration to call ochs and junior revolutionary. So what you have is a smooth, cylindrical shaped case, with screwed case back and unique lugs. This seems like a good time for some measurements – you’re looking at a 7.0mm crown on a 42mm watch, coming in at a featherweight 65g on the leather strap. Titanium is wonderful that way. 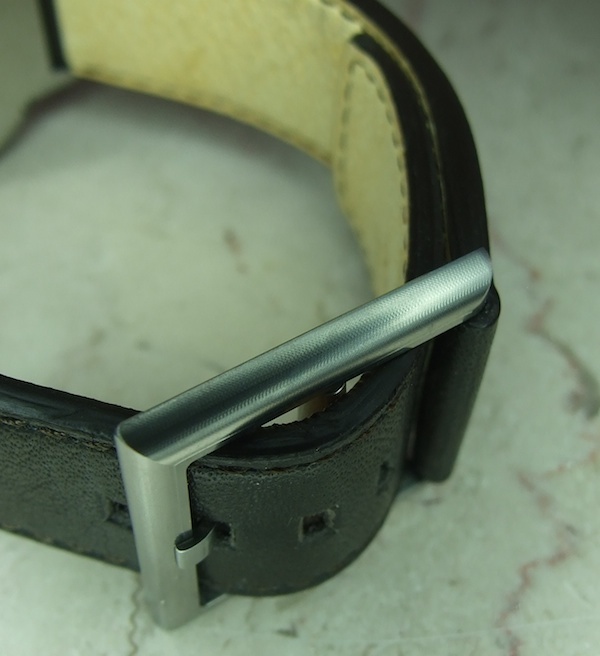 22mm lugs, 29 by 28mm buckle. 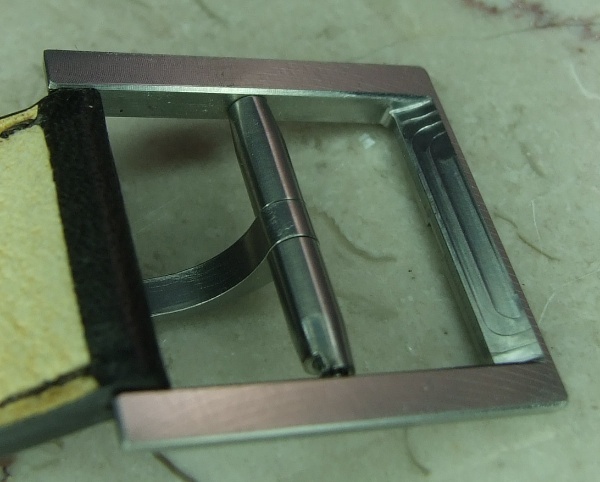 The case is 9.8mm thick, and 10.9 to the top of the double-domed sapphire crystal. Despite having a non-screwdown crown, it’s rated to 50m of water resistance and has actually been torture tested. Normally I’d assume that ’50m’ means “Don’t get me wet!” but in this case it’s safe for swimming. Lume is pretty good, though the lack of minute markers make readings a bit approximate. You can get the tinta series in any Pantone color you want, the orange on black works quite well with good contrast and a bit of flair. 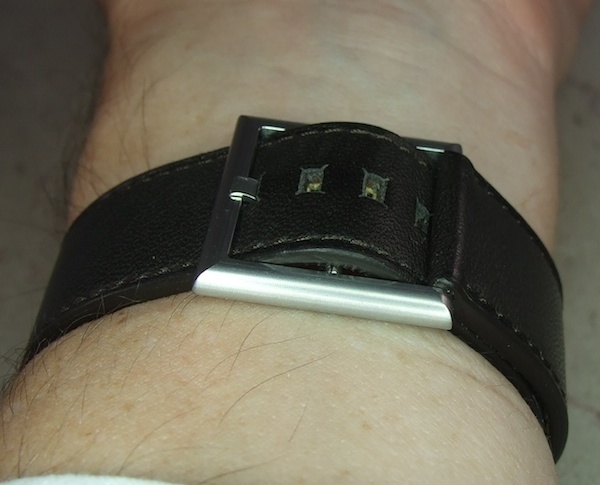 This could easily be a nearly unnoticed watch with, say, light grey or white hands. One note on comfort: I found that the square-cut crown bit my wrist a bit, and have confirmed with Beat that you have but to ask them when ordering, and they’ll round it off for you. The straps are also available in three different lengths. Clever, eh? At first glance, it looks normal. A bit of practice required, but I like the result, sleek and finished in appearance. If you don’t like it, you can get a conventional buckle instead. 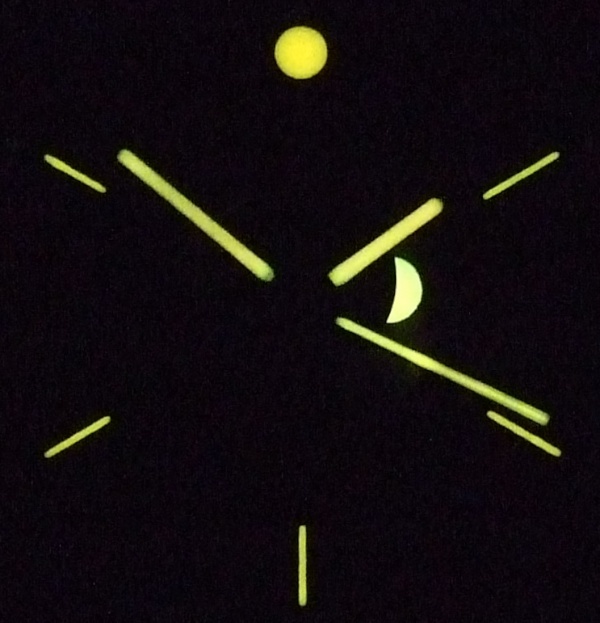 I had the watch for about a month, and thus got to watch a full cycle of the moonphase. It’s tremendously cool, and the crescent-shaped window with contrasting titanium plate is just neat to look at. Timekeeping was, as you’d expect, well within chronometer specifications. Overall this is a watch for the devoted connoisseur. The lack of branding or bling combined with the steep cost add up to something that only a few will appreciate. It’s a realization of a singular vision of timekeeping, done with unique aesthetics and cost-is-no-problem construction. I will be sorry to see it go. There’s a new guy in town 🙂 So what’s the price of this piece (of art) ? Probably out of my reach but hey..
Nice review of what I think is a really cool watch. I probably won’t ever buy one at that price but the design and company ethos is refreshing. It really wouldn’t kill them to do something a bit more stylish with the case back though! I’m not considering my self a connoisseur, in fact I’m quite far from it. I totally like the watch, it ha s a certain simplicity and elegance, clever stuff inside that simple makes me tick when I look to it. Those imperfection left after the building process are indeed something that a connoisseur can appreciate. 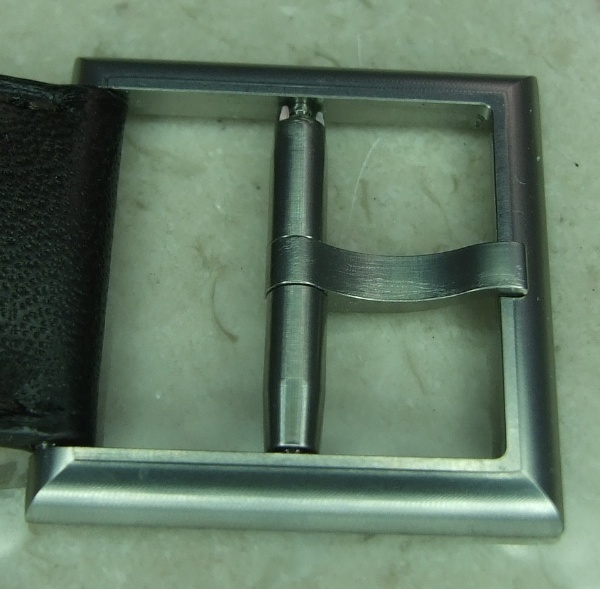 I have experience with that buckle type, its been around for a while and you can buy blanks on eBay. I find it fairly awful and not very comfortable, and the 2 orders filled that requested it are torn: one that likes it and another that doesn’t. To each his own, but this is not a new invention by any stretch. That aside, I really enjoy this case and dial. a part of me wants a bit of flash and something (exhibition, fancy engraving, etc) on the caseback, but I get that would be the antithesis of the rest of watch. I would certainly have one and wear it oten, but not with hat sticker: it’s about 4x where it should be. And you might mind how you label revolutionaries: the hyperbole police are highly sensitive. A “phantom” version should be nice, too. A bit too “modern art” for me. Like an aluminum sculpture of a pig with wings and face of a human. I might wear it as a conversation peice, but I’d have to stop periodically to punch myself in the face. Why so expensive? 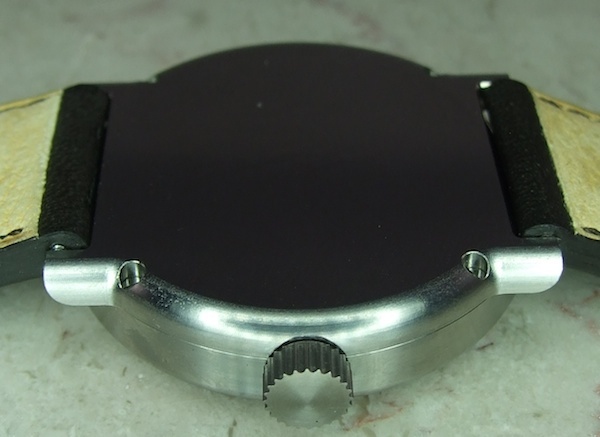 The materials are nice and the moon phase complication is truly great, but nothing about this watch screams “I’m worth $8500 US!” Normal ETA movement (which grade I wonder), normal materials, and no finishing because they like the way the tool marks look. Fair enough, but it also cuts out a lot of expensive and time-consuming polishing and such. Oh yes, and packaging Swatch would be proud of, had they thought of it first. For $1000-1500, it’d be remarkable and I’d be saving for one now. I just don’t see where the price is justified, considering all the cost savings realized in the production and packaging. Am I missing something? $500 tops! 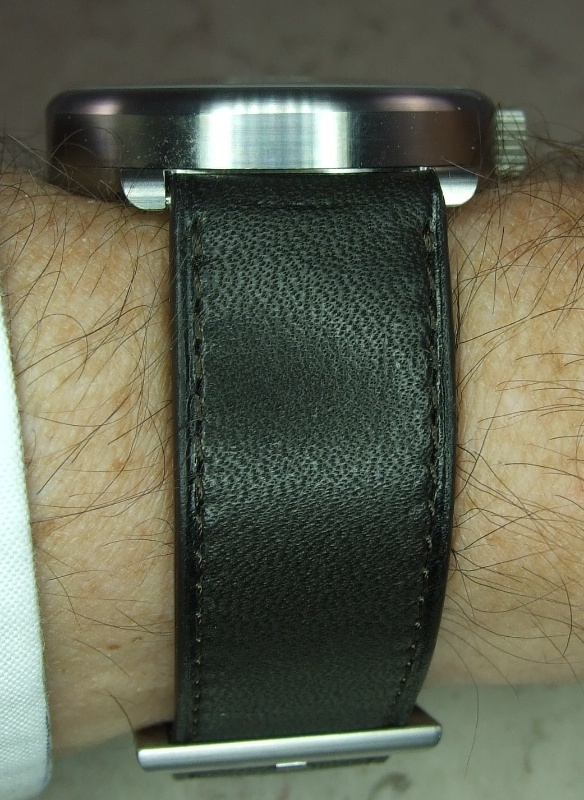 A brand new “used” watch look… great minimalist design but it does look like the unknown comic watch. The Walmart card display hanger is humorous, is it shipped in a paper bag? You could wear it over your head when you wear the watch. 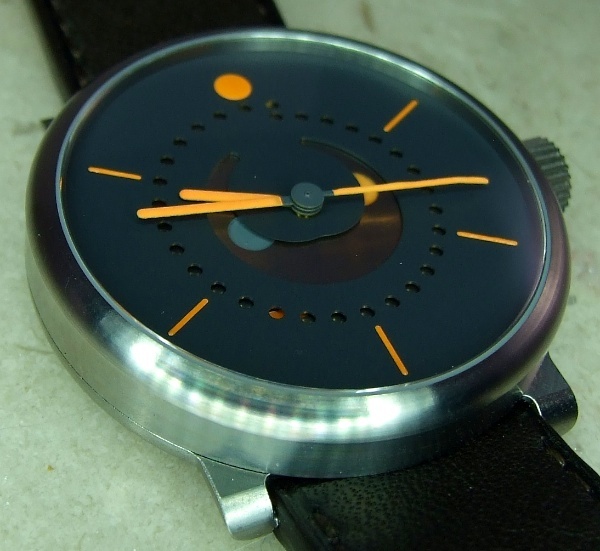 It reminds me of some trendy/quirky design watches I’ve seen in some shops and at airports. They are usually minimalist and have something quirky about them which tends to appeal to hipster types. All that is fine and dandy, but those watches that I speak of, cost under $500. Unfortunately, this one looks similar but unrealistically costs much, much more. As many have said, it doesn’t reflect it’s cost in any way, thus its an expensive whim. 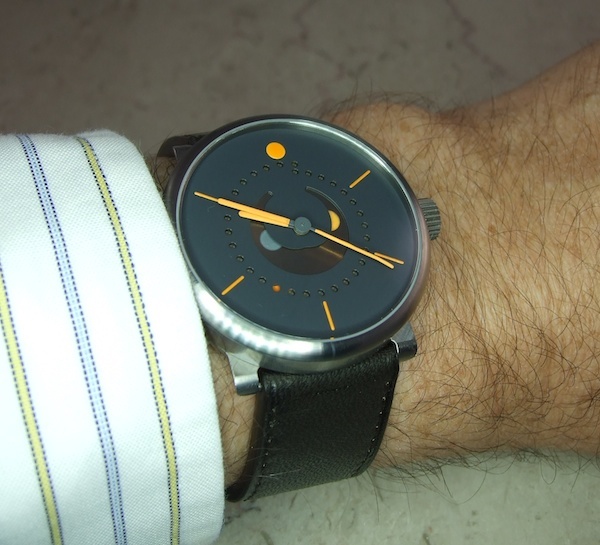 this a beautiful moonphase!!! 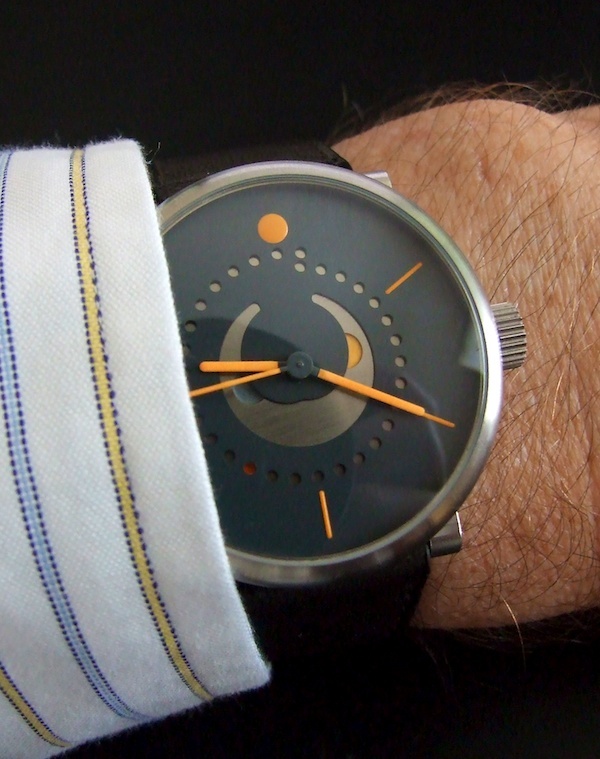 very clever design and looks great on the wrist.